(MENAFN - Gulf Times) Democrat Amy Klobuchar joined the 2020 White House race on Sunday, adding a pragmatic voice from the heartland state of Minnesota to an ever-growing field of contenders hoping to unseat US President Donald Trump. In a speech that was almost a point-by-point rejection of the president's policies and the country's toxic divides, she told supporters: 'We are tired of the shutdowns and the showdowns, of the gridlock and the grandstanding. 'Enough is enough. Our nation must be governed not from chaos but from opportunity, she added. 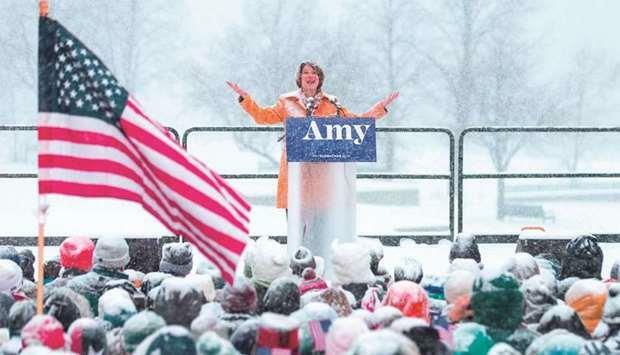 Klobuchar, the 58-year-old granddaughter of an iron miner, made the announcement before a heavily bundled-up crowd under gray and snowy skies in a park along the Mississippi River, as volunteers passed out handwarmers. In a year when many Democrats say their top priority in a candidate is an ability to defeat Trump, Klobuchar's words seemed — time after time, issue by issue — to target the president. She said that if elected she would return to the international climate treaty on 'Day One. She promised more stringent gun laws and set a target of universal health care, while calling for America to support its troops, diplomats and intelligence officers. 'They deserve better than foreign policy by tweet, she said. In typical fashion, Trump swiftly reacted to Klobuchar's announcement on Twitter. 'Well, it happened again. Amy Klobuchar announced that she is running for President, talking proudly of fighting global warming while standing in a virtual blizzard of snow, ice and freezing temperatures, he said, repeating his unfounded suggestions that cold weather is evidence against climate change. 'Bad timing. By the end of her speech she looked like a Snowman (woman)! Klobuchar has been visibly building a national profile. Crucially, she has proven popular even in the more Republican-friendly rural parts of her state. She won re-election in November by a resounding 24-point margin, carrying 1,200 precincts won by Trump in 2016. A former prosecutor with an unpretentious demeanour, she referred again and again in her speech to her roots in a region that prides itself on an ethic of honesty and hard work. But at odds with that image, her own work ethic has emerged as a focus of criticism in recent days. Several former aides have been quoted saying she is difficult to work for, with bouts of 'explosive rage leading to exceptionally high staff turnover. Her defenders say she is simply someone who demands excellence, and that the allegations against her would not be made against a man. Klobuchar, 58, pointedly wore neither a hat nor gloves during her speech in bitterly cold weather, her brown hair and mustard-yellow coat gradually turning white with the accumulating snowfall. 'I don't have a political machine, I don't come from money, she said. 'But what I do have is this: I have grit. I have family. I have friends. I have neighbours. I have all of you. Minnesota Republicans, with a poor record against Klobuchar, have tried nonetheless to blunt her announcement, portraying her as overly cautious and perhaps not up to a nationwide challenge. 'Minnesota Nice is not going to work on a national stage, Jennifer Carnahan, chair of the state's Republican Party, told the Star Tribune newspaper. While many of the high-profile Democrats already in the race are in the progressive lane — liberal Senator Elizabeth Warren formally declared her candidacy Saturday — Klobuchar has quietly gained attention in Washington as a centrist. She is known for putting partisanship aside to pass legislation, something that has earned her a devoted following in Minnesota, and something American voters regularly tell pollsters they want. 'If you just go in your opposite corner of the boxing ring, you never get anything done, she said on ABC's ‘The View' late last year. 'Courage is whether you're willing to stand next to someone you don't always agree with, for the betterment of this country. In a historically diverse Democratic field, Klobuchar is the fifth woman to seek the nomination. Senators Kamala Harris of California, Kirsten Gillibrand of New York and Warren of Massachusetts have all thrown their hat in the race, as has congresswoman Tulsi Gabbard of Hawaii. Former vice president Joe Biden is known to be weighing a candidacy, and former Texas congressman Beto O'Rourke has said he will announce his plans this month.